CSR Racing was leading the top grossing charts not too long ago. At the time, It was reported that the game was making 12 million dollars per month from In App Purchases. 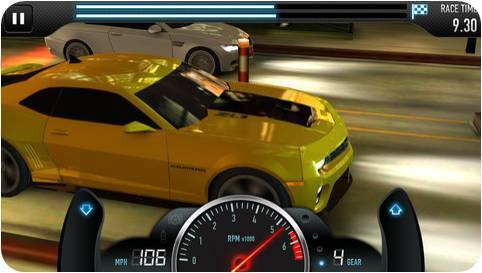 One might notice that the game play experience is actually very simple and instead of providing a full driving simulation all that is required from the user is to shift gears in time. That is really not hard to mimic and in fact, many games are offering that exact same interaction. What really makes this game different from other games is the In-Game Store. It was reported that users are spending more time in the store then driving the car on the road.Judging from personal experience this is very true. Like you, I was also curious so I repeatedly played the game with the risk of getting addicted in order to find out what’s the secret sauce of the CSR Store. Let’s start with the technical details. The store for CSR racing has two main parts: Car Dealer and Workshop. The car dealer offers a large variety of cars organized by maker and levels. Interesting to notice is the fact that all the cars can be compared based on 4 parameters: Bhp, Grip, Weight and Gearbox. The other part of the store is the Workshop. This is where you can upgrade the car with 7 different items: Engine, Gear, Weight, Intake, Tiers, Nitro and Turbo. Each one of these upgrades comes in 5 levels where each item you buy unlocks the next one in the series. For example – buying Engine level 1 unlocks Engine level 2. What makes it interesting is that all of these upgrades are specific to each car and can’t be moved from one car to the other. The outcome of this store design is that there are about 50 cars and 78,125 combinations to upgrade each car which brings the total to over 3M combinations while keeping the design of the store relatively simple. Further more, all the different combinations of upgrades and cars comes back to the same 4 parameters which are the interface between the game and the store. This allows for modifying or adding more virtual goods easily by altering the store and without changing the code of the game. Finally, the core game loop is limited by fuel to 7 races per time period (normally 30 minutes). This mechanic limits the amount of cash a user can get and forces him to be much more strategic when he spends it. He then spends much more time in the store where he will be tempted to pay with cash to save long waits or get a desirable car.